NORMAN, OK (Dec. 18, 2018) — The University of Oklahoma offensive line was selected today as the winner of the 2018 Joe Moore Award for the Most Outstanding Offensive Line Unit in College Football, announced The Foundation for Teamwork, which has presented the unique award since 2015. The Sooners are the first team from the BIG-12 Conference to win the only award in college football that recognizes a group or a unit. The announcement of the 2018 Joe Moore Award winner was made during a surprise visit today to Oklahoma’s campus. The Joe Moore Award trophy, crafted by award winning sports sculptor Jerry McKenna, is the largest trophy in college football, standing at a height of almost seven feet and weighing in at over 800 pounds. It will be displayed on the Oklahoma Sooners campus until the conclusion of the 2019 college football season. Coached by co-offensive coordinator Bill Bedenbaugh, OU’s offensive line was the driving force behind an offense that is on pace to break the single-season FBS record for yards per play. The Sooners are averaging 8.7 yards per snap this year, a mark that would top the record of 8.6 yards per snap set by Hawaii in 2006. Bedenbaugh’s offensive line unit has been instrumental to OU's success on that side of the ball, also paving the way for quarterback Kyler Murray’s Heisman Trophy winning season. Oklahoma leads the country in points per game (49.5) and yards per contest this season (577.9) despite ranking tied for 107th out of 130 teams in plays per game (just 66.1). OU is also averaging 0.71 points per offensive play. Going back to 1996, the highest end-of-season figure was 0.69 by 2013 national champion Florida State. 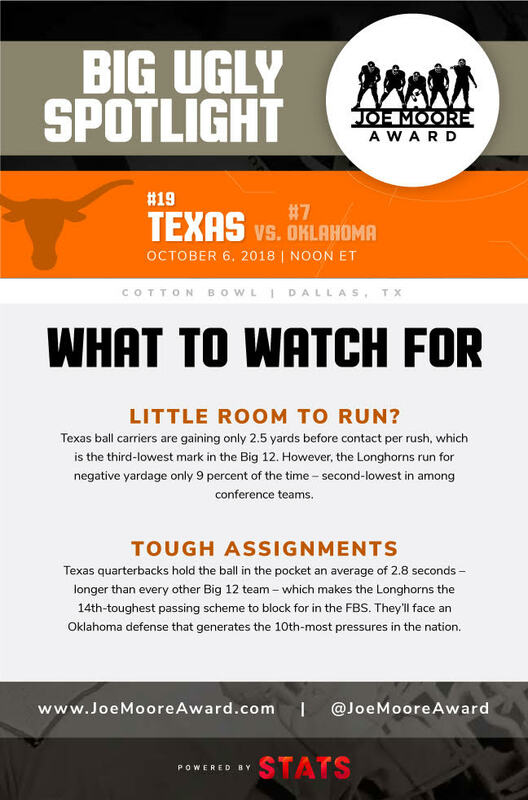 What makes those numbers even more impressive is the fact that the Sooners had to replace two All Big-12 First Team offensive line starters in Erick Wren and Orlando Brown, two-time All-American and 2017 Heisman Trophy winner Baker Mayfield at quarterback, and one of the country's top running backs, Rodney Anderson, who was lost for the year in this season's second game due to injury. Oklahoma's starting line has featured redshirt junior left tackle Bobby Evans (13 starts), senior left guard and Outland Trophy semifinalist Ben Powers (12 starts), redshirt freshman center Creed Humphrey (11 starts), senior right guard Dru Samia (13 starts) and redshirt junior right tackle Cody Ford (13 starts). Redshirt senior Jonathan Alvarez also started two games at center and one at left guard. All 5 starters with 11 or more starts earned 2018 All-Big 12 Honors. No. 4 Oklahoma will make its 52nd bowl appearance when it takes on No. 1 Alabama in the College Football Playoff Semifinal at the Capital One Orange Bowl on Dec. 29 at 7 p.m. CT. The Joe Moore Award voting committee judges solely on six criteria: toughness, effort, teamwork, consistency, technique and finishing. Evaluations were made through weekly review of actual game film and offensive line coach-provided cut-ups on the DragonFly Division I Network. In addition, STATS, the industry’s leader in sports data analytics, provides advanced O-line data and analytics to give context and clarity, and to help streamline the film evaluation process. The voting committee also went through each of the finalists’ season-long highlight reels and multiple back-to-back quarters of game film. The 13-member Joe Moore Award voting committee selected a midseason honor roll in October 2018, followed by selection of semifinalists in November and finalists in early December. After the regular season, a voting body of 200-plus members selected the 2018 winner of the Joe Moore Award. This voting body includes all of the current offensive line coaches at the Division I/FBS level, as well as former players, coaches, colleagues of Coach Moore, select media members and the Joe Moore Award voting committee. The Joe Moore Award voting committee comprises individuals who are highly knowledgeable about offensive line play, including former linemen, coaches, talent evaluators and media analysts. This group conducts in-depth analysis by reviewing game tape every week of the season to assess both the fundamentals and subtleties of overall O-line performance. The Joe Moore Award is the only accolade in college football to honor a position group. It is named after Joe Moore, widely regarded as one of the best offensive line coaches in college football history, most notably for his work at Notre Dame and the University of Pittsburgh. Coach Moore sent 52 players on to the NFL, including Bill Fralic, Mark May, Russ Grimm, Jimbo Covert and others. But it’s about more than just football. It’s about how we live our lives, how we contribute to society, how we participate in the realization of great things. Teamwork is a bond. It’s a promise. And it’s a commitment to put the greater good above ourselves. It’s the greatest form of individual achievement because it requires total sacrifice – of focus, of effort, of ego. The road to success requires a universal commitment to purpose that creates an unbreakable bond between each of us. And it makes that success one of the greatest achievements on the planet. NEW YORK (Dec. 4, 2018) — The Joe Moore Award for the Most Outstanding Offensive Line Unit in College Football today revealed the selection of three finalists for this year’s national honor, announced The Foundation for Teamwork, which has presented the unique award since 2015. Finalists in the running to be named the top collegiate O-line in the country include (in alphabetical order) *No. 1 Alabama, *No. 5 Georgia, and *No. 4 Oklahoma. For games played through Dec. 1, this year’s finalists have a combined record of 36-3 and average 528.1 total yards per game (compared to the national average of 406.1 total ypg) and 235.9 rushing yards per game (compared to the national average of 176.99 rushing ypg). The award’s voting committee will announce the recipient of the 2018 Joe Moore Award after a surprise visit to the winning university’s campus in late December. “The finalists embody what the Joe Moore Award is all about, which is hard-working, like-minded individuals working their tails off for the greater good without desire for personal gain,” said Aaron Taylor, CBS college football analyst and founder of the Joe Moore Award. “The voting was extremely close, but the 2018 Finalists separated themselves to the committee through consistency and setting the tone for their entire teams. In addition to the Finalists, I was particularly impressed by Clemson’s growth over the season and Memphis’ tenacity.” Taylor played guard at the University of Notre Dame for the award’s namesake, the legendary offensive line coach Joe Moore. Evaluations for finalists were made primarily through weekly review of actual game film and offensive line coach-provided cut-ups on the DragonFly Division I Network. In addition, STATS, the industry’s leader in sports data analytics, provides advanced O-line data and analytics to give context and clarity, and to help streamline the film evaluation process. Alabama has scored points on 68.2 percent of drives in which they picked up a first down, the fourth-highest percentage in the nation. 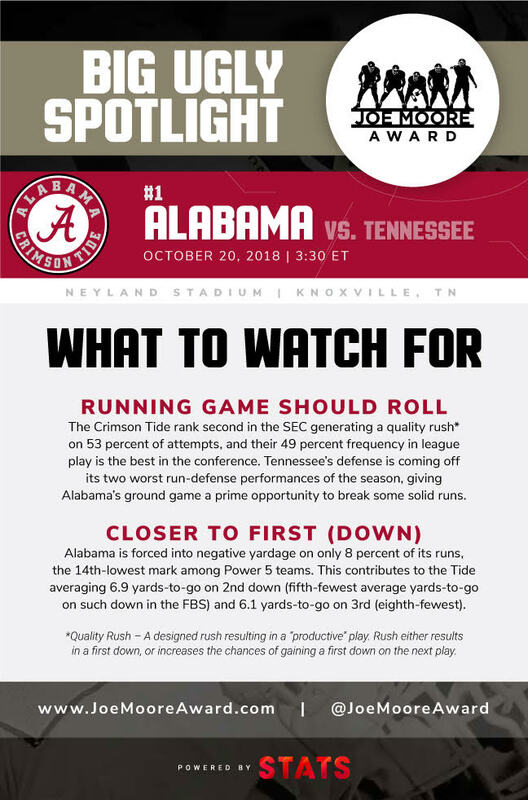 Combine that with the fact that the Tide have gone three-and-out on just 9.3 percent of their offensive drives – fourth lowest in the FBS – and it’s no surprise that Alabama has averaged an SEC-record 47.9 points per game. Alabama has rushed for negative yards on just 54 of their 492 rush attempts this season (11.0 percent), its second lowest mark in the last 20 seasons. Crimson Tide rushers have scored 31 touchdowns this season, most in the SEC. The Crimson Tide have allowed a sack on just 3.4 percent of drop-backs this season, the second-lowest mark in the SEC and their lowest sack rate in the last 25 seasons. Thanks to that protection, Alabama has averaged 10.8 yards per pass play on third down, second most in FBS. Georgia is averaging 7.3 yards per play this season, fifth most in the FBS this season and the highest mark in program history. The Bulldogs have gone three-and-out on just 9.6 percent of drives, fifth lowest in the FBS - and averaging 3.27 points per drive, fourth most in the nation. The Bulldogs have averaged 6.4 yards per rush on first and second down, most in the SEC and fifth most in FBS. Georgia racked up 250 rushing yards in eight games this season, tied with Georgia Tech for the most among Power-5 schools and tied for fourth most in FBS, trailing only Army, Navy, and Memphis. Georgia’s line has allowed its passers to complete a program-record 68.6 percent of passes and post a 1.6 percent interception rate, the third-lowest mark in program history. Bulldogs passers have been especially effective when opponents blitz, posting a team passer rating of 200.4, third highest among FBS teams with at least 25 pass attempts against the blitz. Oklahoma’s high-powered offense has been a big story this season, as the Sooners lead FBS in points per game, yards per game, and yards per play. The Sooners have gone three-and-out on just 6.8 percent of drives - nearly two percent better than second-place Army - and they’ve averaged .711 offensive points per snap, the highest mark in FBS in the last 25 seasons. Oklahoma rushers have averaged 6.7 yards per carry this season, second in FBS and the highest mark in Big 12 history. The Sooners have rushed for negative yards on just 15.2 percent of carries this season, second lowest in the Big 12. The Sooners has passed for an average of 11.1 yards per drop-back this season, the highest rate in Division I history. Oklahoma has been especially good at moving the chains, as 48.8 percent of its total drop-backs have resulted in a first down or touchdown, the highest rate in the FBS. The next step will be for a voting body of 200-plus members to select the 2018 recipient of the Joe Moore Award. This voting body includes all of the current offensive line coaches at the Division I/FBS level, as well as former players, coaches, colleagues of Coach Moore, select media members and the Joe Moore Award voting committee. 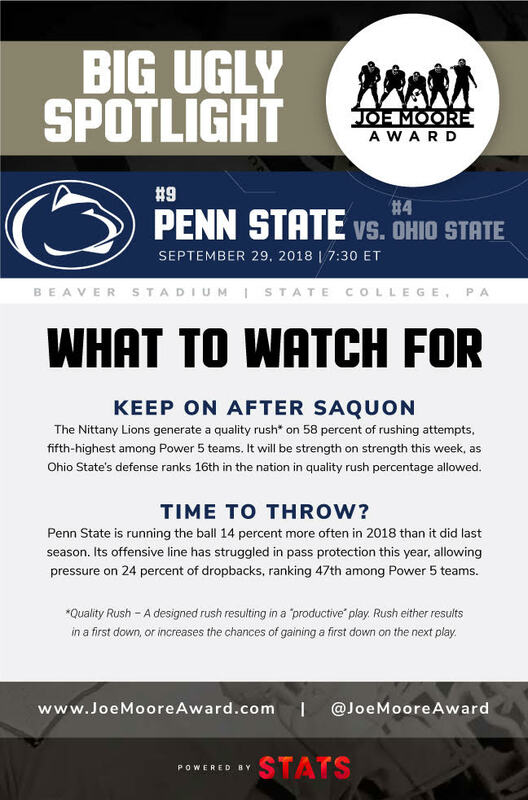 In addition to reviewing game tape every week of the season, the Joe Moore Award voting committee will go through each of the finalists’ season-long highlight reels and multiple back-to-back quarters of game film. NEW YORK (Nov. 20, 2018) — The Joe Moore Award announced its annual selection of the semifinalists representing this year’s Most Outstanding Offensive Line Units in college football. The Joe Moore Award has presented the unique award since 2015. The ten semifinalists include #1 Alabama, Arizona State, #2 Clemson, #5 Georgia, Memphis, #3 Notre Dame, #6 Oklahoma, #24 Pittsburgh, #7 Washington State, and Wisconsin. This year’s semifinalists represent six conferences and one independent (in alphabetical order): AAC (1), ACC (2), BIG TEN (1) BIG 12 (1), PAC 12 (2), SEC (2), and Notre Dame. For games played through Nov. 17, this year’s semifinalists have a combined record of 90-20 and average 485 total yards per game (compared to the national average of 409 total yards per game) and 223 rushing yards per game (compared to the national average of 174 rushing yards per game). In addition, the following O-line units received Honorable Mention recognition for their play this season (alphabetical order): Appalachian State, Army, Kentucky, Utah State and UAB. The Joe Moore Award voting committee will announce its selection of finalists on Dec. 4, 2018, and the selection of the 2018 Joe Moore Award Winner will be made public after a surprise visit to the winning university’s campus in late December. Evaluations for semifinalists were made primarily through weekly review of actual game film and offensive line coach-provided cut-ups on the DragonFly Division I Network. In addition, STATS, one of the industry leaders in sports data analytics, provides advanced O-line data and analytics to give context and clarity, and to help streamline the film evaluation process. The Crimson Tide O-line has paved the way for 500+ total yards in 10 of 11 games, which is currently the most such games in FBS. The Tide lead the SEC and are T-9th in the FBS with just 10 sacks allowed. Alabama is on pace to become the fourth team on record (since 2000) to average at least eight yards per play over the course of a season. The Sun Devils have only allowed 15 sacks this season, which is 2nd in the PAC 12 and T-24th in the FBS. Arizona State’s O-line has paved the way for RB Eno Benjamin to gain 1,444 rushing yards this year, just 121 yards shy of the school record of 1,565 (Woody Glenn, 1972). Benjamin is currently 4th nationally with 131 yards per game and T-12th in PAC-12 with 12 rushing touchdowns. Only team in FBS with 400+ total yards of offense in all 11 games. Clemson’s O-line has paved the way for the Tiger rush game to gain 6.6 yards per carry, which leads the ACC and is second in the FBS. Of the 6.6 yards per carry, an impressive 71% of the yards come before the ball carrier is touched (4.7 yards before contact), which is 6th best in the in the FBS. Despite starting four different alignments on the O-line this year, Georgia leads the SEC in Rushing Offense at 257 yards per game and also leads in SEC-only games at 232. Georgia is on pace to have one of the best scoring averages in UGA history this season. The Bulldogs have scored 40+ points in six games this year and are averaging 39, which is second in the SEC. Georgia calls a run play on 85% of “Gotta Have It” run plays, defined as 3rd and 4th down and three yards or less, or goal-to-go situations. This is among the highest in the country and indicates that the coaches have a high degree of confidence they will convert. The Tigers O-line has paved the way for RB Darrell Henderson to rush for 1,521 yards, which is 2nd in the FBS. One of only three FBS teams in top ten in yards per play (7.4, 4th in FBS), pass yards per attempt (8.9, 10th in FBS), and rush yards per attempt (6.4, 3rd in FBS). The other two are 2018 JMA Semifinalists Georgia and Oklahoma. Thanks to one of the most physical O-lines in the country, Memphis’ offense averages 523 yards of offense per game, which is 7th best in the FBS. The Irish O-line has paved the way for the offense to gain more than 400 yards of offense in of 11 games (only 14 teams have more 400+ yard games). Notre Dame has averaged 185.5 rushing yards/game in its four victories over AP top-25 opponents. The Irish rank fourth in the FBS in rushing yards/game among teams with at least four games played against AP top-25 foes. Notre Dame gained 365 yards rushing on 50 carries against the Florida State defense, the most allowed by the Seminoles since Georgia Tech gained 401 yards on the ground against Florida State on Oct. 10, 2009. Despite losing preseason All-Big 12 running back Rodney Anderson for the season in Week 2, Oklahoma leads the Big 12 and ranks ninth nationally with its 260 rushing yards per game. OU is the nation's only team this year with at least 30 rushing touchdowns (36) and at least 30 passing TDs (35). Behind the Sooners’ offense line, Oklahoma leads the nation with 6.9 rush yards per carry, with an incredible 5.2 of those yards coming before the ball carrier is touched. For the season, Pitt is churning out 247 yards per contest on the ground. That average ranks 14th nationally and 3rd in the ACC. The Panthers have averaged an incredible 346 rushing yards per game over their last four games. The Panthers O-line paves the way for their ball carriers to convert 87% of “Gotta Have It” situations (3rd/4th and three or less, and goal-to-go). This is 23% better than the FBS average. Washington State has allowed just seven sacks this season on 537 pass attempts, fewest sacks allowed in the PAC-12 and tied for 3rd-fewest allowed in the country (one sack for every 76 pass attempts). The Cougars O-line protects a passing attack that leads the FBS with 405 passing yards per game and is T-4th with 37 TD passes. The power five average for “clean pockets” (pass pro opportunities with no pressures allowed by an O-lineman) is 80% yet, despite being a pass heavy offense, Washington State’s O-line provides a clean pocket 86% of the time which leads the PAC-12 and is among the best in the country. Wisconsin ranks 4th nationally in rushing at 277 yards per game. Wisconsin’s O-line has paved the way for Jonathan Taylor to gain a nation leading 1,869 rush yards, almost 350 more rush yards than next-highest total in the FBS (Memphis RB Darrell Henderson has 1,521 rush yards). Wisconsin has gained 150+ rush yards in every game this season, one of only four FBS teams that can make this claim (also Army, Houston and Oklahoma). After the finalists are selected on Dec. 4, a vote will be held to select the 2018 recipient of the Joe Moore Award by a voting body of 200-plus members. This voting body includes all of the current offensive line coaches at the Division I/FBS level, as well as former players, coaches, colleagues of Coach Moore and select media members. The Joe Moore Award is named after Coach Joe Moore, widely regarded as one of the best offensive line coaches in college football history. He is most notably recognized for his work at Notre Dame and the University of Pittsburgh. Coach Moore sent 52 players on to the NFL, including Bill Fralic, Mark May, Russ Grimm, Jimbo Covert and others. The Joe Moore Award trophy, crafted by legendary sports sculptor Jerry McKenna, is the largest trophies in all of sports, standing at a height of 6 feet and weighing in at 800 pounds. The perpetual trophy is made available for display by the winning university until the conclusion of the following college football season. The Foundation for Teamwork is a 501(c)(3) organization dedicated to fostering teamwork in all societal endeavors and bringing that spirit of collective achievement to athletics, education, and organizations. Find out more at joemooreaward.com and follow the Joe Moore Award on Twitter (@joemooreaward), Instagram (@joemooreaward), and Facebook (facebook.com/JoeMooreAward).